My mama said there would be days like this. Days when things don't always go right. Days when life is not a bed of roses. Days when my computer has gone off to the fixit guy. but in the meantime I just couldn't stay away. of Spring in my garden. several years ago and have a good day. I am off to do some serious playing. Computer problems have overtaken me. This does not delight me, but each time I learn to be more of my own IT person. the resident cat, Shelly, waited. She waited there all night. The next day as we sat by the fire reading we left the door open for her. for her afternoon nap. I think I snoozed a bit with her too. She loved it when I talked to her. She shared a few things with me that she had learned from Colette. and if you are ever at the Oregon coast, you must stop by and enjoy this special place. Say "hi" to Shelly from me. my little green teapot, small cups, and tea. with anyone I might meet. It has become my traveling tea party. Do you travel with a tea party in your car? What do you carry with you to make your road trip special? 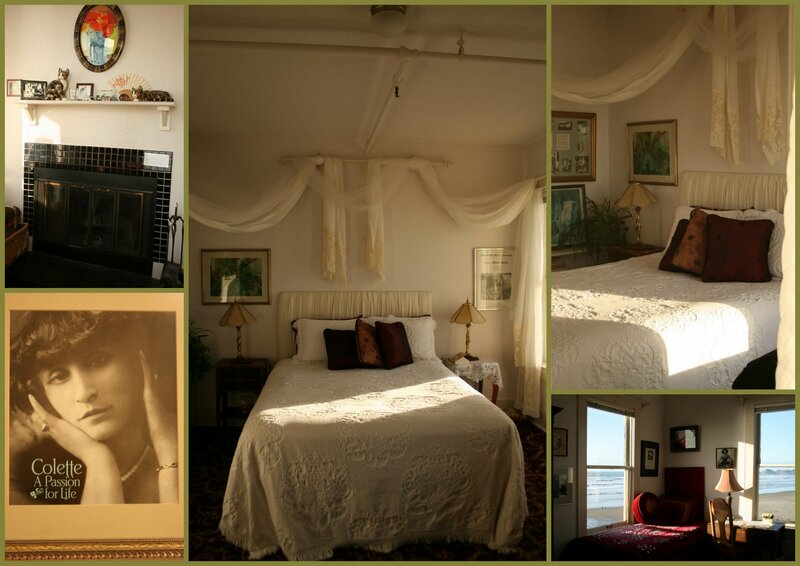 more authors rooms at the Sylvia Beach Hotel. is the Samuel Clemens room (Mark Twain). Even Dr. Seuss has a room here. 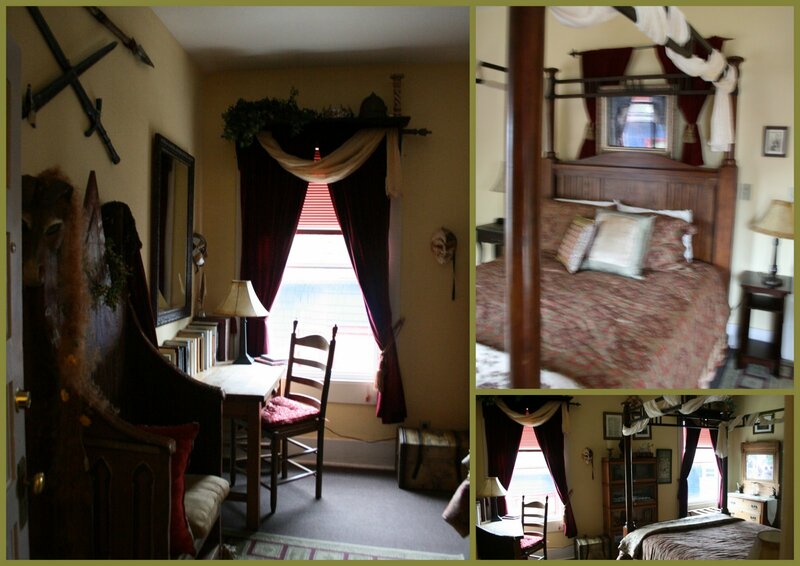 but each room is unique and a delight unto itself. what author would you choose and why? How would you decorate it? You can click on any of these pictures to enlarge and see more detail. 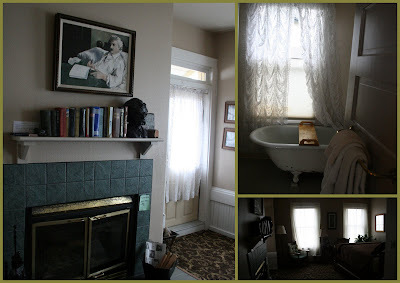 Each room in the Sylvia Beach Hotel is decorated for a different author. The Colette room is the room my husband reserved. and a small private deck, plus a fireplace. Each time we stay here we try to stay in a different room. The Collected Stories of Colette edited by Robert Phelps. I found her to be very descriptive in her writing. Now I want to read more of her short stories. "Leave me alone, I'm sick and cranky, like the sea. I no longer have one secret place left in me...."
stepped into the Colette room. and the ocean just outside the window. that sick and cranky feeling away and this is what it was for me. Toes wiggled in the sand! For a few days last week I did escape to wiggle my toes in the sand by the Pacific Ocean. The view here is from the deck just outside my room at the Sylvia Beach Hotel. This is my all time favorite place to stay. No phones, no television, and a cat by the name of Shelly in residence. actually Nye Beach to be exact. and enjoy the quiet and the crackling fire. or maybe dinner as we are served family style. At the dinner table often the game is played called "Two truths and a Lie". and you meet the most interesting people here. place to stay, just check out the Sylvia Beach Hotel here. I will share more of my time at the beach and this special hotel this week. Congratulations! Please email me your address and this package will be on it's way to you. I am reminded of perfume shops in Paris. We open containers and sniff. Oh the fragrance sitting there. or is a sweetness we smell there. Maybe what we smell is bergomot or orange and cloves. 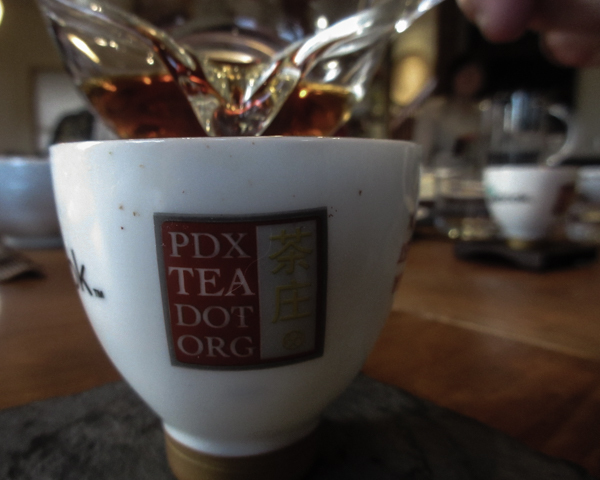 take a sniff and savor the special smell of tea. pervades each cup of tea." Henri Mariage, founder of Mariage Freres. Photo taken in Barcelona, Spain, as I stepped inside a beautiful, small tea shop. Don't forget the give away mentioned on Tuesday. The drawing will be announced on Monday morning. I love a winter sea. It is calling me to come and wiggle my toes there. Don't forget the give-away mentioned yesterday. 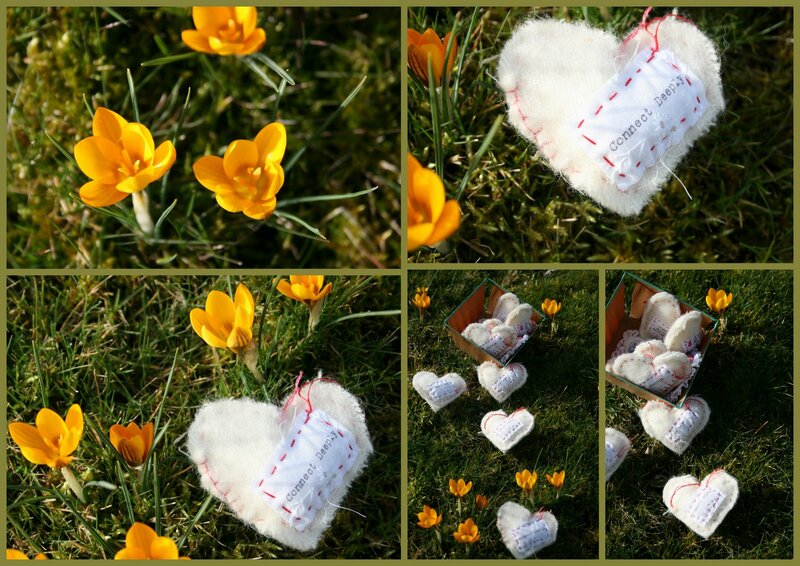 Hearts and Flowers can be displayed so many different ways. The flowers here are my first crocus of the season. grow in my lawn in the shape of a heart. they haven't disappointed this year either. There are other hearts here too. I am having a small give away. 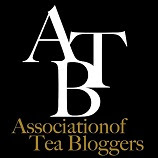 along with a copy of the newly released issue of Tea a Magazine. Just leave a comment here to be placed in the drawing. The winner will be announced next Monday. Happy Valentine's to all of you. May your day be filled to overflowing with love. More sweet than love of youth. The passion of red hearts and flowers is seen here. or is it just the thought, dear friend. yet set aside for you. February 14th is the day of LOVE. Valentine's Day it is called. 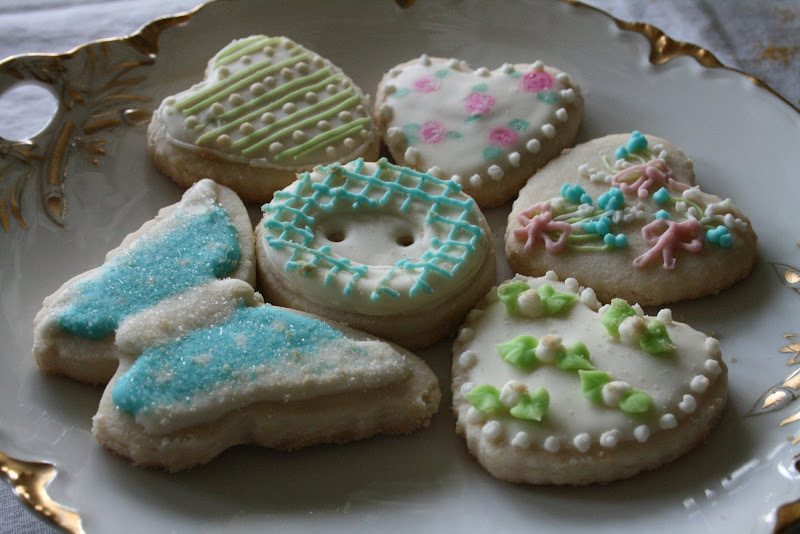 with cookies made of all things sweet. and cherishing the thoughts of LOVE. that each day should be a day of LOVE. but certainly a hug and the hearing and telling of LOVE. I see PASSION in this day. A day of red hearts, red roses, and boxes of chocolates. because I know each day is a day of LOVE. 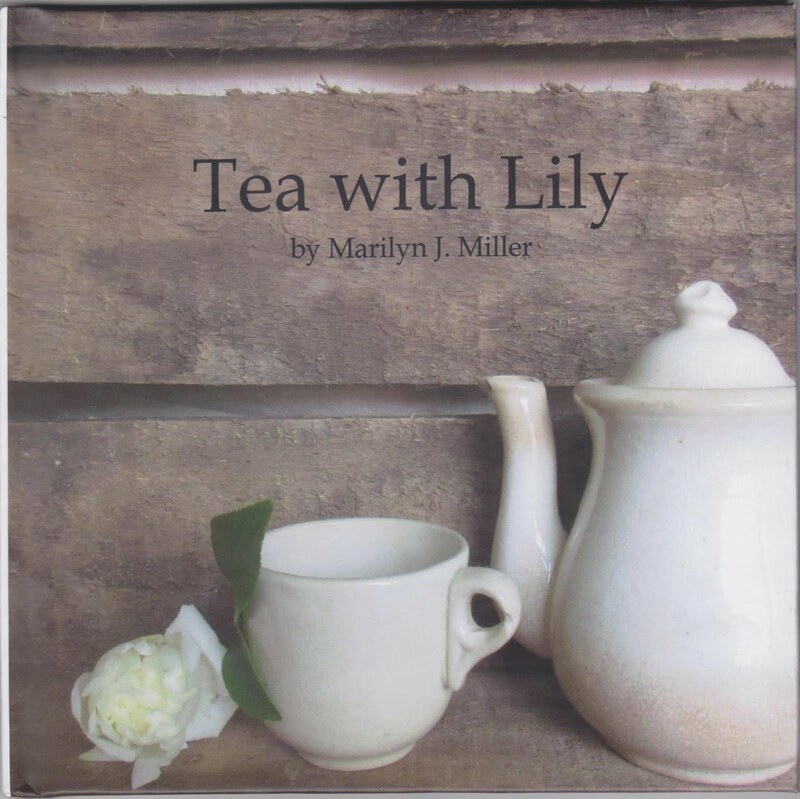 One of the products sold at Marmalady's is sewing patterns for tea lovers. One of the patterns is potholders for teapots. The pattern has two different potholders inside. One is a butterfly inspired by a friend. but inspired by the one in the picture. on the top of the teapot. It keeps it in place quite nicely. potholder quite easily and put a lop there. a pattern. Come by www.marmaladys.com and check the patterns out. If you don't sew, you might have a friend that would love to make it for you. Not a very pretty picture, but the house next to mine. It has sat empty for 2 years as it has been in foreclosure. Oh how I wish there were a neighbor there. A neighbor would bring "soul" back into this house. Seeing this empty house has given me thought as to who is my neighbor. Is a neighbor only someone that lives next door? Is my neighbor someone I meet face to face at the market? Is my neighbor someone that touches my heart from around the world? Is my neighbor the ones that suffer with ill will in their countries? Looking in the dictionary it says that my neighbor is someone close to me. I hold those in my heart that are suffering, is that close enough to qualify as my neighbor? As Mr. Rogers use to sing, Won't you be my neighbor? When a favorite magazine arrives in the mail I take a small vacation. This was started with the original Victoria Magazine. I make myself a cup of tea and maybe add a cookie too. Then I find a comfy place to sit without distractions. And for an hour I savor every word and every picture there. and have a smile on my face. Tea a Magazine, and Victoria Magazine. special about holding the magazine in my hand. Do you take a small vacation when a special magazine arrives? Which magazine gives your heart a smile? this beautiful Pie Bird for a dear Christmas gift. gained popularity in America in the 1930's. the pie bird is also collected as a novelty. Thanks, friend for this special gift. I have always wanted a Pie Bird. Don't you just love when that winter sun shines in the window. This week the sun was shining in the window and it just made my heart sing. The first camellia of the season with the light shining here too. A song within my heart. But never one I keep. Recently I woke to a couple inches of the fluffy, white snow. A perfect day to scoop up some snow in a pretty teacup. Putting some snow in the freezer for later it became a ball of ice. Isn't it interesting how temperature makes the difference? The weather had gotten cold enough to change our normal rain to snow. Putting the snow in the freezer changed it to ice. The same goes for temperature and tea. put in hot, boiling water. A black tea tastes much better when steeped in boiling hot water. An oolong tea tastes better when the water is just under boiling. Do you try your teas in different temperatures? makes when steeped in a different temperature of water. Have fun with your next cup of tea and steep it in a different temperature than usual. For Christmas a dear friend gave me a new cookbook. The following recipe from this cookbook was pure delight for two recent events. for any tea party too. EnJOY! Preheat oven to 350 degrees. Put tart pans on baking sheet. Combine poppy seeds, flour, and salt in a medium bowl. Add the butter and work it into the flour mixture with your fingertips until the mixture resembles coarse bread crumbs; this can also be done by pulsing ingredients in a food processor as well. Stir in the egg and cold water. Put the dough onto a lightly floured work surface, knead it a couple of times, then form it into a flat disc. Divide the dough into 2 pieces and roll one piece of the dough out with a rolling pin to about 1/4 inch thick. Cut the dough to fit tartlet pans. (I made one 6 inch tart and 14 small individual tarts from this recipe) Gently press the dough into each pan and trim the pastry flush with the pans edge to create a neat appearance. Roll the other half of the dough and line the remaining tartlet pans. Place the baking sheet into the oven and bake until light brown. 12 to 15 minutes Put the tartlets on a cooling rack and let cool before removing the baked crusts from each pan. For serving spoon about 2-3 tablespoons of Ricotta filling into each shell and top with Chili-Grilled Eggplant and Sweet Roasted Peppers, Garnish with balsamic julienne roasted peppers. Serve at room temperature or can warm slightly in oven at 350 degrees for 10 minutes. Combine all ingredients except sesame seeds in a small bowl and combine. Preheat grill to medium. Slice the eggplant into 1/4 inch thick slices and put the slices on a baking sheet. Stir the chili oil and the 1/4 cup olive oil together in a small bowl. Lightly brush both sides of the eggplant slices with the oil mixture and dust with a little ground cumin and salt. Place the eggplant and peppers on the grill. Roast the eggplant until soft and well marked by the grill, about 2 minutes on each side. Remove from the grill to cool. Roast the peppers until black on all sides, 10 - 15 minutes. Remove from the grill and let cool. Peel the black skin off the peppers and then stem, derib, and take out the seeds. Put the eggplant slices, the remaining 2 tablespoons olive oil, half of each of the roasted peppers, garlic, and a little salt in the bowl of a food processor. Pulse until chunky, 5 - 10 seconds. (I pulsed a little longer) Remove from the bowl and season with more salt, if desired. Cut the remaining roasted peppers into julienne strips and toss with the balsamic vinegar. Garnish the eggplant mixture with the julienne balsamic peppers. Store in refrigerator covered for up to 1 week. These julienne strips would be delicious in a tossed salad too.